Today we're pleased to welcome John Harmatuk to Cracked Sidewalks. Coach Tuk is the head basketball coach at Cy Springs High School in Houston, Texas where he coaches current MU commit Erik Williams. 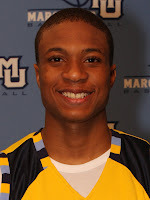 Erik is one of the top five players in the Houston area, one of the top 100 recruits in the country and was the first player to commit to MU from the class of 2009. Here's a Q/A about Erik that Coach Tuk was kind enough to provide to us. When you are done reading the Q/A, check out the latest entry on his blog -- a terrific article which details Erik's performance this season. Enjoy. How is Erik performing this season for Cy Springs? Erik averages about 24 pts 12 rebounds and almost 6 blocks a game. His numbers have been there all season, all we need him to do now is bring intensity to every possession. If you check his stats, he will have a majority of his points in a half. For example 26 of his 33 against Langham Creek was in the second half. He struggles with maintaining energy every possession, as do most talented high school kids. He is really working on this because he knows in order to get minutes next season, he must stay focused every possession. Last season Erik suffered a significant foot injury, has he fully recovered from that? Do you think his athleticism has been compromised due to the injury? Erik actually broke his foot, it's called a Jones fracture and its pretty common with taller basketball players. His foot is fully healed. He has some lingering affects of over compensation (soreness in other areas, etc...) but he is fully healed from the injury. After strength coach Todd Smith gets him, you will see just how athletic Erik plays. Erik is listed at 6'7", does he project to be a shooting guard or a wing at the college level? Erik has to prove who he can guard before you can label him a position. I need him to protect the paint; block shots and rebound. So he doesn't get the opportunity to guard the ball on the perimeter very often. He will have to get better guarding the ball before he can be a 2or3 at the college level. What parts of Erik's game have shown the most improvement this season? I would say not allowing poor offense to affect the rest of his game. He is our only player with any experience, my next two best players are a freshman and sophomore, so Erik has had to shoulder a huge load. For example he had 32pts 15 rebs and 16 blocks against Cy-Fair and we lost in overtime. Teams are throwing a box and 1, double teams, etc... and Erik has let that affect the rest of his game. Last Friday vs a box and 1, however, he had 6pts, but 12 rebs and 11 blocks. He needs to make plays besides just scoring. What parts of his game will need the most work as he enters college? Guarding the ball, full attention to every possession on both ends of the court, and strength. He also needs to tighten up all other parts of his game. By that I mean, play more compact, more balanced and more efficient. He just uses his length to beat people at the high school level. Next season he will have to improve his footwork to be more efficient, tighten up his ball handling, be stronger with the ball going to the rim. I believe you coached former Golden Eagle Karon Bradley. Did Karon's experience at Marquette concern you when Erik showed interest in the program? Not at all, Karon was not ready from a maturity standpoint to handle the rigors of major college basketball. Erik is the most mature kid I have coached. He understands that to reach his potential as a basketball player he needs a demanding coach and a competitive atmosphere. If Erik buys into the level of intensity Buzz brings, he has a chance to be a special player. It is all up to Erik and he know this. Erik committed early to Marquette. Were you surprised he ended his recruiting so early (and committed to a school away from home)? Not at all, I was actually with him on his first trip to Marquette. Later that night he called his brother and said this is the place for me. It is a basketball institution, its a Jesuit education which appeases his parents, and the type of players Marquette attracts are kids like Erik. He was comfortable at Marquette the moment he stepped on campus. What is the most surprising aspect of Williams' game that will impress Marquette hoops fans? He is a great shot blocker. He has the best timing/coordination combination I have seen at the high school level. He blocks shots with his left hand in order to get his body out of the way. He has had several double digit block games this year, including a school record 16 against Cy-Fair. Great stuff! Thanks, coach, and thanks CS. Can't wait to see Williams on the floor. He sounds like a combination of size and skill we haven't seen since, well, you know who...and he's not 6-7! Quickly: How about Nova beating Pitt and Providence beating Syracuse last night? So much for MU not having impressive wins in conference thus far!! Proving yet again, any conference win is a good win. Great job, guys! This kid seems like he'll be a perfect fit about Marquette. I predict he'll quickly become a huge crowd favorite.